It is one of the most crucial areas of exploration in medicine today – and here is an important addition to the literature on the subject. As research into cancers progresses, scientists are becoming ever more aware that better therapy of acute leukemias depends ultimately on better understanding of the distinction between leukemic and normal progenitor cells. This hugely important new book describes the current knowledge of acute leukemia biology and discusses new classification systems that have arisen as a result of emerging insights into pathogenesis. Estey, Faderl and Kantarjian, who all work at the respected Anderson Cancer Center in Houston, Texas, USA, examine in detail advances in the treatment of particular types of acute leukemia. 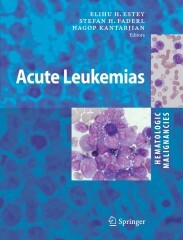 Their book also covers the management of acute leukemia in general as well as the development of new therapies. Dieser Beitrag wurde am 20. Mai 2010 von Oliver Obst in e-Books veröffentlicht. Schlagworte: e-Books, Springer.